As per the provisions of Section 151 of the Companies Act 2013 a listed company may have one director elected by such small shareholders in such manner and with such terms and conditions as may be prescribed. For the purposes of this section small shareholders means a shareholder holding shares of nominal value of not more than twenty thousand rupees or such other sum as may be prescribed. 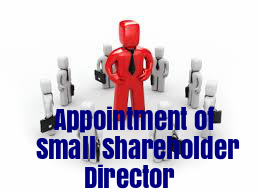 “RESOLVED THAT pursuant to the provisions of section 151 of the Companies Act, 2013, and Rule 7 of the Companies (Appointment and Qualification of Directors) Rules, 2014, and subject to the approval of small shareholders Shri ________, be and is hereby appointed as a small shareholder director on the Board of Directors of the Company for a period of three years w.e.f. ________, whose period of appointment shall not be liable to retire by rotation, in the manner as prescribed in the Act." 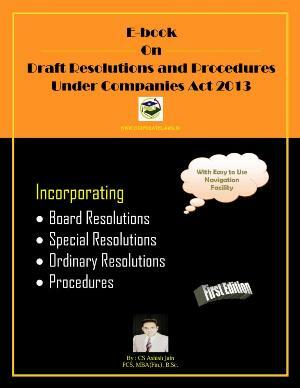 Section 151 of the Companies Act, 2013 read with Rule 7 of the Companies (Appointment and Qualification of Directors) Rules, 2014, provides that a listed company, may upon notice of not less than one thousand small shareholders or one-tenth of the total number of such shareholders, whichever is lower, have a small shareholders’ director elected by the small shareholders. As per the said provisions, The Company has received on ________, a notice from ____________ small shareholders, being not less than one-tenth of the total number of small shareholders, proposing the name of Shri __________, for being appointed as a small shareholders Director to represent on the Board of Directors of the company. Shri ______ has provided his consent to his appointment and a declaration that he meets the criteria of independence as provided in section 149 (6).A copy of the notice received in this behalf is sent herewith. 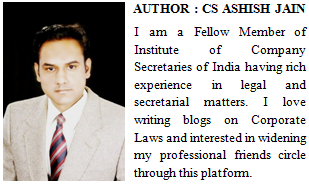 The tenure of office of Shri ___________ if elected, will be for a period of 3 years w.e.f. ______ , whose period of appointment shall not be liable to retire by rotation. As the Company is a listed company, the proposed business for election of Shri __________ as a small shareholder shall be transacted only by means of voting through a postal ballot. The necessary instructions for facilitating exercise of voting right through postal ballot are sent herewith along with notice. Except Shri ________, none of the Directors, Key Managerial Persons of the Company and their relatives is/are concerned or interested in the resolution.